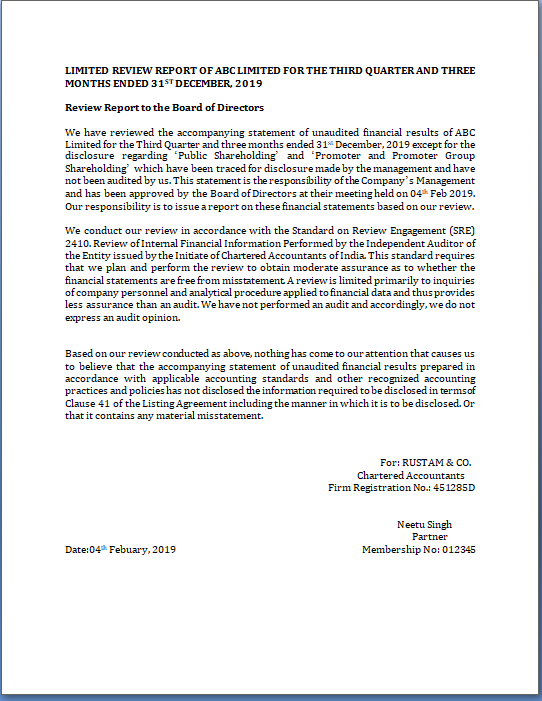 We have reviewed the accompanying statement of unaudited financial results of ABC Limited for the Third Quarter and three months ended 31st December, 2019 except for the disclosure regarding ‘Public Shareholding’ and ‘Promoter and Promoter Group Shareholding’ which have been traced for disclosure made by the management and have not been audited by us. This statement is the responsibility of the Company’s Management and has been approved by the Board of Directors at their meeting held on 04th Feb 2019. Our responsibility is to issue a report on these financial statements based on our review. We conduct our review in accordance with the Standard on Review Engagement (SRE) 2410. Review of Internal Financial Information Performed by the Independent Auditor of the Entity issued by the Initiate of Chartered Accountants of India. This standard requires that we plan and perform the review to obtain moderate assurance as to whether the financial statements are free from misstatement. A review is limited primarily to inquiries of company personnel and analytical procedure applied to financial data and thus provides less assurance than an audit. We have not performed an audit and accordingly, we do not express an audit opinion. Based on our review conducted as above, nothing has come to our attention that causes us to believe that the accompanying statement of unaudited financial results prepared in accordance with applicable accounting standards and other recognized accounting practices and policies has not disclosed the information required to be disclosed in terms of Clause 41 of the Listing Agreement including the manner in which it is to be disclosed. Or that it contains any material misstatement.